Today was a good day for riding and for thinking. 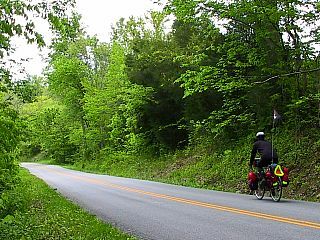 Kentucky hasn't completely flattened out for me, but the climbs are getting easier and easier. Most of the time I didn't really notice the elevation I was gaining until I would be pleasantly surprised with another nice descent down roads so lush that they seemed like tree-lined tunnels. Just outside of the small town of Bryantsville I was riding past a gentleman who was in his front yard. I waved, he waved back, and he hollered for me to stop awhile if I had the time. It felt like as good a moment as any to take a little stop, so I pulled off the road and met with Gareth Lane. Gareth had recently retired from Lexmark and is helping out on the small family farm owned by his parents. We talked about his Alfalfa, and his weed problems, and he mentioned that he they had also grown tobacco in recent years. I'd never seen a tobacco plant before, so we headed out to their barn and he showed be a dried tobacco plant that had been hanging since last year. Just as I was fixing to get back on the road Gareth said he would like to introduce me to his parents, whom lived just across the street from him. 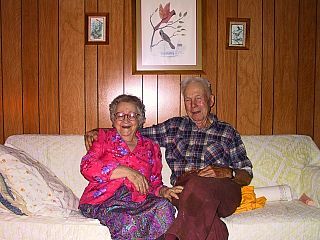 We headed inside and I met with Carl and Minnie-Ann who were both in their late eighties. It seemed like before I knew what hit me I had been invited for dinner and to stay the night with his parents. Not wanting to look a gift horse in the mouth, I happily accepted. Carl showed me around the farm and we talked about all the crops he had tried raising there over the years. He seemed to delight in showing me all the machinery and describing what things had looked like when he used to raise dairy cows. Minnie-Ann liked to talk about her childhood, their courtship, and their family. I noticed that Minnie-Ann would often interrupt Carl to change the subject, and showing the wisdom of his years he would just let her and then finish his point at a later time. Many years have passed since Minnie-Ann was a young girl, and I don't think she has traveled much since then. I'd love to be able to know what her mental image of the world is like, and to see the things she has seen change during her life. She kept asking me charming questions like whether or not we had television yet where I lived. I think we all stayed up past our bedtimes talking, but around 11:00 I finally turned in and Carl and Minnie-Ann weren't far behind. Have I mentioned how much i am enjoying your trip. This page is a great read. When she asked if you had television yet did you tell her it was available in your area, but that you thought it was a fad and therefore you didn't own a TV? When I was 10, my family and I stayed at a buddist retreat which was owned by a friend outside of I believe Fiddletown N.C. They did not have plumming and you always had to check for copperheads before you took a seat on the thown in the outhouse. Anyway, I am sure plumbing is somthing new to that area. You are putting together a great read. Keep it up. I had to do a little catching up on your reports since Kristi, Will and I just moved to a new house at the other end of Placerville. By the way, we are going to have another boy in October. My wife read my comment. Please see my corrections. Plumbing is spelled with a "b" not Plumming and I meant to spell Thrown. It's great being married with a teacher. Might as well be red pen marks all over the screen..Kristi sends her luv....I mean love.